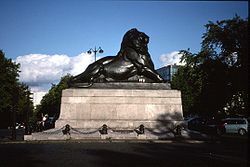 The square Place Denfert-Rochereau is named after Pierre Denfert-Rochereau, the French commander who organized the defense at the siege of Belfort during the Franco-Prussian War (1870-1871). It is dominated by the Lion of Belfort statue (a smaller version of the original in the town of Belfort) by Frédéric Bartholdi (remembered mainly for designing the Statue of Liberty). The square is located in the 14th arrondissement of Paris, in the Montparnasse district where is Paris Catacombs museum.